Pulau Bunaken is an island off the coast of Sulawesi in Indonesia. Sulawesi lies next to Borneo, and is approximately 1700 km from North to South as you can drive it. A flight from Singapore or Kuala Lumpur (Silk Air, Air Asia, Garuda) into Manado leaves you a half our drive and 40 minute boat ride from the island and some of the most spectacular diving and snorkeling in the world. Boats to the island can either be arranged through your hotel, or there are both private boats and a regular ferry service from the Manado harbour to Bunaken and Siladen. Accommodation options are available on Bunaken, Siladen or on the mainland in Manado. We stayed at the “4 Fish Hotel” in Tongkaiana which allowed us to go over to Bunaken and Siladen, but also explore the volcanoes and markets around Manado. The 4 Fish can be booked through Booking.com or Agoda. We also had lunch at the Siladen Resort Hotel, and if you are looking to go a bit up market, then this is a beautiful choice with a very nice pool, spa and close to the Siladen reef. 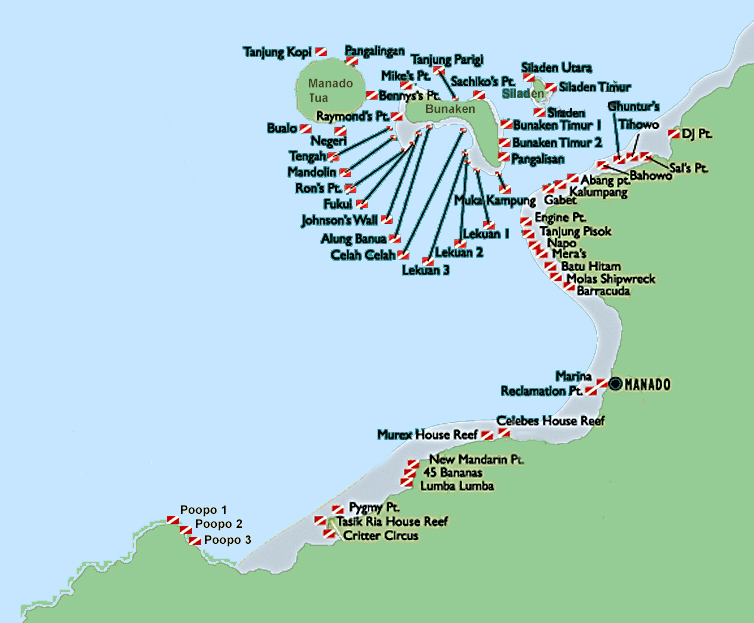 Pulau Bunaken and Pulau Siladen are small islands, surrounded by coral walls. These walls house drop off to around 30m, and house an abundance of life. They are inhabited by a myriad of fish, turtles and sharks. Sea snakes can also be seen amoungst the reefs. Lekuan 1, 2 & 3, Tengah and Bunaken Timur 1 & 2 are the best places for Snorkeling on Bunaken. For Siladen, jump off the jetty and follow the current down the wall to the old jetty. It is quite a distance and there is an abundance of life in the shallows above the reef, and along the wall. Be conscious of the currents (especially with children) as they can be quite strong when the tide is turning. If you are looking for even more diving or snorkeling options, you can also head across to the other side of the peninsular to the lesser visited Lembeh Straight, which also has spectacular diving spots. We were traveling with 3 children this time – 12, 8 and 6 years old. For our 6 year old son we had flippers, and this helped in the stronger currents. It also helps to get them confident swimming in a snorkel in a swimming pool before you go. A rash shirt is essential to avoid sunburn and avoid touching the corals. I also wore yoga pants while snorkeling as I am prone to burning. 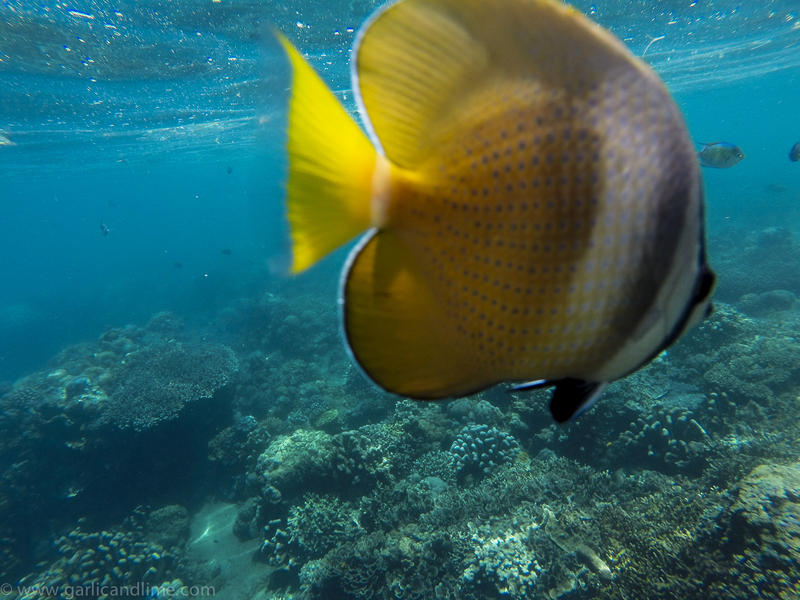 If you have your own snorkeling gear then it is a good idea to take it with you as the gear available for hire is not necessarily the best quality. Please be careful not to touch the coral. It is not stone and you will damage it, but there are also fire corals that leave your skin very swollen and itchy if you brush against it. “Mopiko” anti itch cream which you can pick up in the pharmacy at Singapore Airport is quite effective against the itch if you do end up touching the fire coral. Plastic pollution is a real problem in Indonesia, please don’t add to it by throwing your plastics into the sea. Take your rubbish with you back to your hotel rather than leaving them on the boat. We had an absolutely brilliant time snorkeling around Pulau Bunaken and Siladen. Swimming hand in hand along the reef with my 6 year old son, with a myriad of fish around us, in a life sized aquarium was an experience that will be long remembered. Good to read that you had a lot of fun here together with your family.